At Open Gym you can enjoy Eagles' 18,000 sq. ft. of FUN! 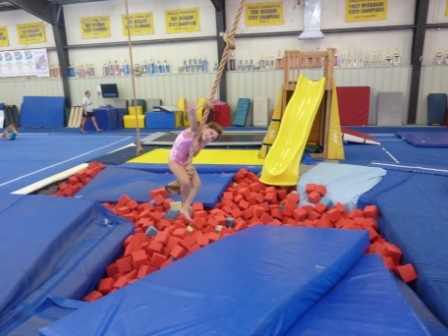 Jump in our AWESOME pit, swing on the ropes, practice your gymnastics on the bars, beams & spring floor! Supervised by a coach Open Gym is open to all kids so feel free to invite a friend, cousin or neighbor! When the kids are out of school, we probably have one of our AWESOME MEGA-Open Gyms! These are TWO solid HOURS of supervised playtime in Eagles gym! Check the website calendar for upcoming dates.